Chicago Sinfonietta’s Trademark really has to be one of the most creatively imagined concerts you’ve ever heard of. Under the direction of music director Mei-Ann Chen, and still very much inspired by founder Paul Freeman (1936-2015), Chicago Sinfonietta is deservedly known for their creativity. They’ve won a MacArthur Award for Creative and Effective Institutions (MACEI) as well as the Spirit of Innovation Award from the Chicago Innovation Awards, and when you look at the concert their presenting September 16 and 18, you don’t wonder why. In their design for Trademarks, Chicago Sinfonietta really takes the idea of a classical orchestral concert into several new dimensions, with performances from Liam Teague and the NIU Steelband alongside performances of Mozart and Smetana. Teague also performs with harpist Faye Seeman in her composition Fayed to Blue. Just as imaginative as the program itself is their presentation of it in a brilliantly designed Digital Guide at their site, where you can learn about each guest artist, each composer, each work on the program. Trademark also includes the World Premiere of a major new collaboration between Cerqua Rivera Dance Theatre Artistic Director Wilfredo Rivera and Brazilian composer Clarice Assad. The new work, called Sin Fronteras, features a performance by Cerqua Rivera, in choreography by Rivera, with Chicago Sinfonietta performing Assad’s score. 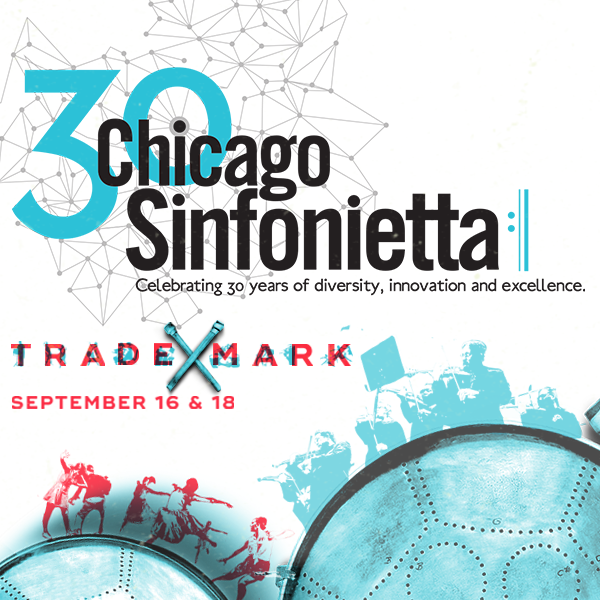 Chicago Sinfonietta will perform Trademark twice. On Saturday, September 16 they’ll be in Naperville, Illinois at Wentz Concert Hall (171 E. Chicago Ave, Naperville, IL 60540) at 8PM (you can find Naperville tickets here), and on Monday September 18, they perform again at Symphony Center (220 S. Michigan) in Chicago at 7:30 PM. (You can find Symphony Center Tickets here).